The purpose of the session was to better understand governance challenges related to forest landscape restoration (FLR) implementation, and options to address these. The session was organised as follows: Stephanie Mansourian introduced the subject of governance and FLR. 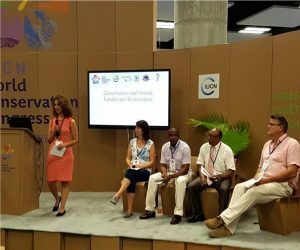 She was followed by four case study presentations: Nadine Crookes from Parks Canada, John Crockett from the US Forest Service, Gérard Rambeloarisoa from the Madagascar Biodiversity Fund and Chris Buss from IUCN, and then 20 minutes of questions and discussion. A total of 30-40 participants attended the one hour session. The introductory presentation addressed the following questions: What is governance? Why is it relevant and important to forest landscape restoration? Where do the two intersect? It set the stage for the four case studies which presented snapshots of four situations with some commonalities, yet many differences. Nadine Crookes presented a case study from Cape Breton Highlands National Park (Canada) which explored governance arrangements to enable boreal forest restoration in the Park. In order to manage the moose population which is affecting natural regeneration in the Park, a partnership between Parks Canada and the Unima’ki Institute was established whereby Mi’kmaw hunters manage moose populations. Nadine highlighted the importance of trust and of collaborating and working closely with the communities in this effort. John Crockett then presented the Puget Sound watershed in the US where the governance challenges are the multiple jurisdictions and tenure arrangements in the watershed. He highlighted the diverse ownership of lands in the watershed which may be federal, state, tribal, and private. Therefore, in order to restore the watershed these different stakeholders have to come together around a common set of goals. A Skokomish Watershed Action Team (SWAT) was established in 2005 as a broad-based collaborative group promoting restoration of the Skokomish River watershed. It is an informal collaborative group consisting of major landowners and more than 20 organizations and its mission is to work towards common ecological and economic goals in the Skokomish River watershed through collaborative basin restoration projects. Under this partnership all groups have an equal voice, and decisions are taken by consensus. Gérard Rambeloarisoa presented the Fandriana Marolambo (Madagascar) forest landscape restoration project which has been ongoing for over 10 years. He highlighted how over the course of the project the focus shifted from the forest administration being the central stakeholder to the communities in the landscape becoming the focal stakeholders. New governance arrangements were designed over the course of the project, notably to ensure the management of the national park that was created in the landscape and also to restore and manage the area around the park. Finally, Chris Buss presented the concept of Forest and Farm Producer Organisations highlighting that in the majority of areas around the world where there are opportunities for FLR, smallholder farmers are frequently a major stakeholder. For example, he noted how governments such as Kenya or Vietnam commit to restoring vast areas of forest cover, but that ultimately those responsible for undertaking the restoration would be smallholders. Reconciling the needs and capacities of these different stakeholders operating at very different scales, for the ultimate achievement of forest restoration within landscapes, is challenging and requires mechanisms that support cooperation. The case studies presented situations where the context in terms of technical capacities, legal systems, tenure arrangements, economics, landscape histories, among others, differed significantly. However, all four case studies highlighted the importance of stakeholder engagement and of placing people at the centre of the restoration effort. They also served to illustrate how while governments make high level commitments, engagement of local level people is key as they are the ones likely to benefit or lose from forest landscape restoration depending on governance arrangements.